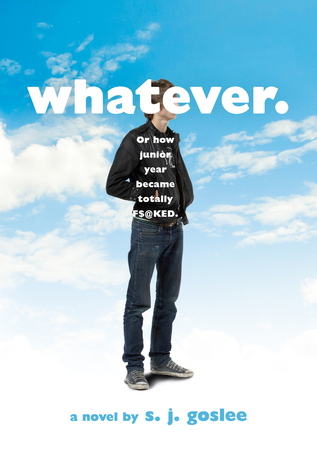 Hilarity ensues when a slacker teen boy discovers he’s gay, in this unforgettably funny YA debut. Mike Tate is a normal dude. He and his friends have a crappy band (an excuse to drink cheap beer and rock out to the Lemonheads) and hang out in parking lots doing stupid board tricks. But when Mike’s girlfriend Lisa, who knows him better than he does, breaks up with him, he realizes he’s about to have a major epiphany that will blow his mind. And worse–he gets elected to homecoming court. I must say that the only reason why I picked up this book was because I was out of books to read, and so I was in search of some fluffy and fast contemporaries to whip up. That’s it. I went in blind without any expectations, and I was shocked, in a negative way, at the outcome. Unfortunately, this book was not written with sensitive readers like me in mind. To be brutally honest, I hated it and could not stand to read it. If it wasn’t under 300 pages, then I would have DNF’ed it. I did not care for the characters, it pretty much had no trace of a plot, and the writing style was too juvenile and immature for my taste. Basically, Whatever revolves around a teenage boy named Mike. When his girlfriend dumps him, he is still quite disappointed even after he gets nominated to be homecoming king,. Soon enough, he finds out that he is suddenly interested in a guy… does this make him gay, and if so, will he find comfort in coming out? I really, really, really disliked Mike. Apparently he was 16, but his decision-making skills and maturity were equal to those of a 6 year old and he went out and did things that 26 year olds would do. He also complained on every single page– this was basically a book all about his whining. Unbelievable. Continuing on what I said before, this story had no plot whatsoever. Heck, why am I even calling it a story? It is certainly not one of those, it’s just a bunch of complaints from a male character who obviously hates his life. That is all I have to say about that piece of the novel. Lastly, the writing. Oy vey. It seemed like this book was written by a child. It was so immature, weird, and juvenile that I can’t place my finger on what made it that way. If you are like me and are not a fan of swearing in books, then it’s a definite no- there was lots of it. I am usually not too picky with writing styles, but I couldn’t stand it in this book. To sum it all up, I couldn’t find any redeeming qualities about this book, and thus I am finding it very hard to recommend to others. Perhaps if there’s someone out there who likes whiny protagonists, immature writing and no plot, then this book would be a good fit for them. The one good thing about this book was that it had LGBTQ+ themes, but even those were flawed and inappropriate at times. In a few words, stay away from this extremely negative book that is Whatever.